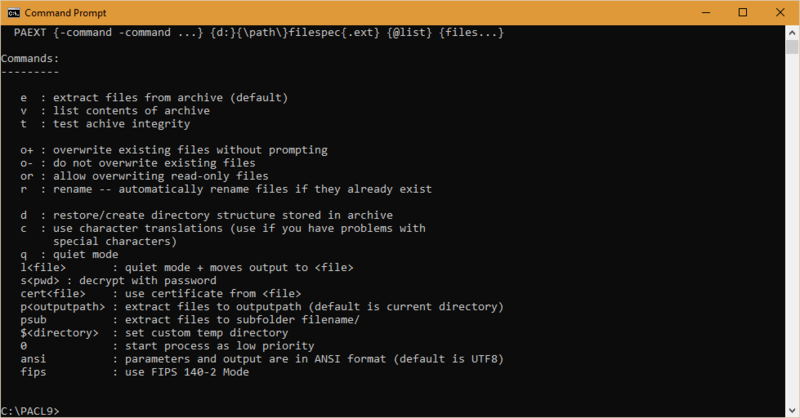 PACL is an advanced command line archiving utility for Windows console environments. It fully supports a variety of the most popular compressed file formats, including: ZIP, 7-ZIP, PA, CAB, JAR, TAR, TAR.GZ, TAR.BZ2, yENC, Base64, CAB SFX and many others. PACL uses FIPS 140-2 validated components. 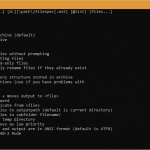 Registered PowerArchiver Professional and Toolbox users may utilize PowerArchiver Command Line free of charge. To request a registration code for PACL, please visit your ConeXware Account. PACL was designed to be a versatile, reliable and scriptable application that can be used in many different configurations and scenarios. 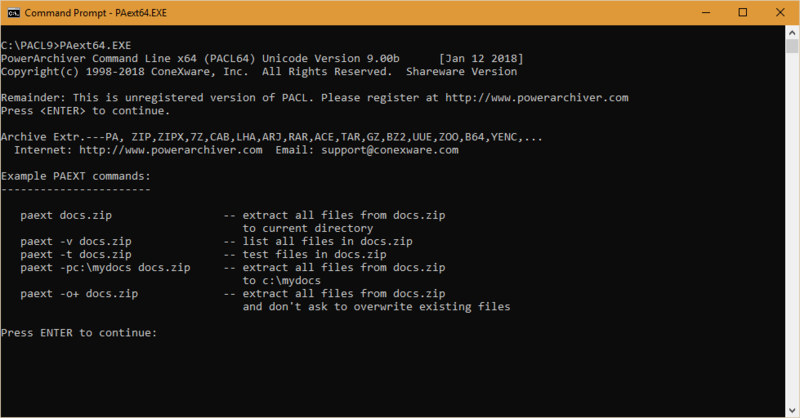 PACL is completely standalone and does NOT require any installation. Copying of required files is all that administrator needs to do in order to start working. Multicore deflate zip engine – almost 16x faster than single core systems on quad core computers. Our multi-core engine provides byte level parallelization of compression, unlike others that are file based. This means that PACL can use unlimited number of threads to speed up single file compression (for instance large database), all while providing superior compression. Improved speed and strength – improved zip compression and extraction on any occasion. Full support for advanced ZIPX format – LZMA, LZMA2, JPEG, PPMd, BZIP2 and WAVPACK in ZIP/ZIPX, according to latest ZIP standards. PowerArchiver is the only application that fully supports Winzip files, while providing faster and stronger compression compared to WinZip. Full support for more basic ZIP format – Deflate codec support that is compatible with all archivers out there, as well as the built-in Windows XP/Vista/7/8/8.1/10/Server ZIP reader. 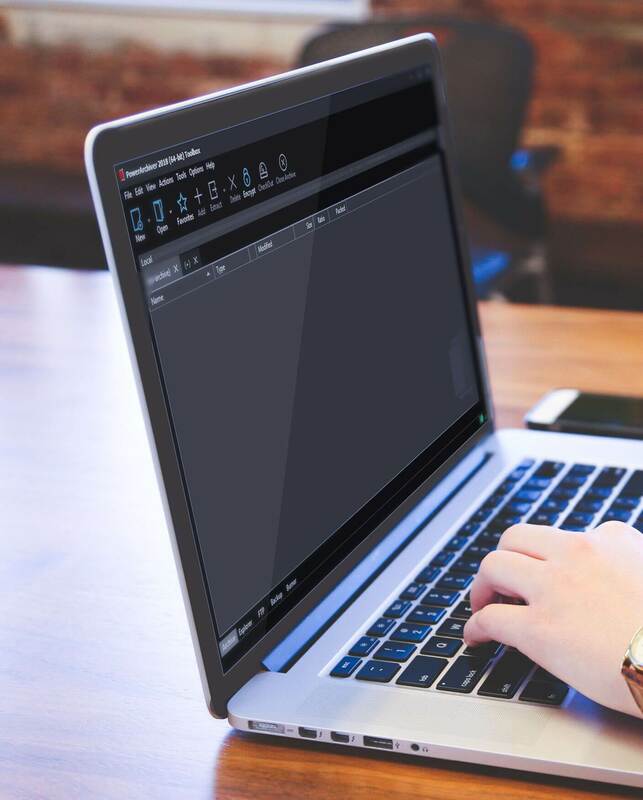 PowerArchiver provides superior compression even in Deflate codec. Unlimited size of the archive – unlimited size of files inside archive and unlimited number of files inside archive. Support for Unicode in ZIP – both read and write support for unicode. Implemented throughout application. ZIP/ZIPX AES encryption support – both PkZip 5.1 and WZ 9.0 standards supported, thus supporting all possible ZIP encryption combinations (Unique feature!) – FIPS 140-2 validated. Advanced Codec Pack (.PA Format) Full support for PA format with much better compression, speed and security. Most advanced format on the market that uses FIPS 140-2 validated components. Based on settings, it can be both several time strong or faster than ZIP compression. PA format – Encryption of files and archives using FIPS 140-2 validated components and ability to encrypt filenames. Superior security due to internal format features. 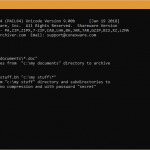 Superior ZIP compatibility – only archiver fully compatible with SecureZip, including reading 3DES encrypted archives and ZIP/ZIPX archives encrypted with digital certificates. Also fully compatible with WinZIP and all other ZIP encryption implementations. FIPS 140-2 Validation – PowerArchiver ZIP/ZIPX AES encryption is not only standard based and compatible with all solutions, it is also FIPS 140-2 validated and it can be used in government agencies required to safeguard protective data with FIPS 140-2 validated solution. Do you need to compress databases, Outlook .pst files, or any other files that are exclusively used by some application? No problem for PowerArchiver – we have exclusive support for VSS (volume shadow support), which is usually used only by enterprise backups to access data that is not accessible to other programs. 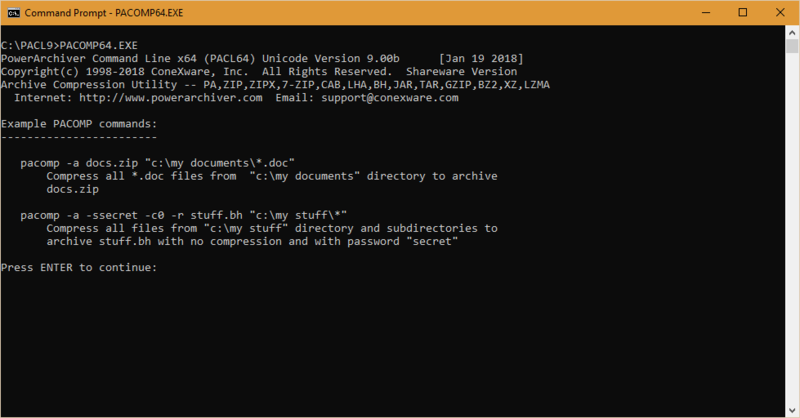 ZIP, ZIPX, PA, 7-ZIP, CAB, LHA (LZH), TAR, GZIP, BZIP2, XZ, BH, XXE, UUE, yENC, and MIME (Base 64). RAR, ARJ, ARC, ACE, MSI, NSIS, CHM, DMG, RPM, CPIO, VHD, XAR, LZMA, SquashFS, CramFS, ZOO, WIM plus ISO (ISO9660 and UDF) disc image formats and more (over 60 formats supported). 20 MB for the program files plus some additional space for backup files (minimal).